Hakim specialises in Muslim Law matters, including Muslim inheritance. 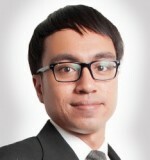 He has experience advising Muslim clients on Syariah-compliant wills and estate planning. *The Call a Lawyer service is only available for Singapore telephone numbers. After payment, your chosen lawyer will call you within 24 hours (Please allow for more time on weekends and public holidays). By clicking the "Agree and Pay" button, you verify you have read and agree to our Terms of Service. If you don't receive a call, please contact us at support@singaporelegaladvice.com within 3 days of submitting your payment. Should additional legal services be needed beyond the phone consultation, you can make arrangements directly with the lawyer. The fee will be deducted from the cost of the additional legal services.